Back when Murray Walker and James Hunt were a newly matched commentary team and Bernie Ecclestone hadn’t yet got his hands on “F1″the brand , the amount of TV coverage that even the world’s permier motor sport series recieved (in Britain at least) was scant. I remember staying awake untill very late on a Sunday night to catch maybe half an hour of ‘highights’ on the BBC. Often the satellite image quality was dreadful so it was like looking through a grubby window (I think that’s the 1979 Argentine GP you see on the left….) , and the local TV director stuck doggedly to the leading car, no matter how little action revolved around it. Seldom did the lo-fi sound match the pictures (that was a Ferrari you saw but you heard a disconnected Cosworth DFV passing the one and only trackside mic’ about half a mile away). 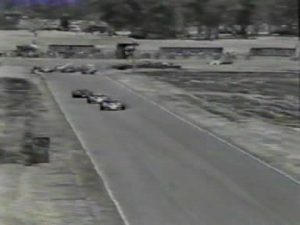 Often the cars below the top half dozen got no coverage unless they crashed and of course the concept of in-car-cameras was known only to Australia TV viewers. Their premier event at Bathrust was already providing not just the excellent images but a running commentary from the driver. In F1 that was half a decade in the future. And even when it did finaly arrive it was seldom fitted on a car near the front of the pack Practice? Qualifying? Good grief! We never saw any of that and if there was an ‘unsuitable’ sponsor in evidence (you know the one…) then we never saw the car that carried it’s livery….even if it was leading! There were exceptions. 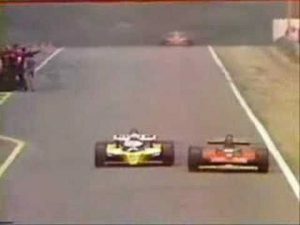 The British GP, being the BBC’s home event, was always pretty well covered and epic moments like Gilles vs Rene at the French GP (right) with Murray screaming “He’s off! He’s Back On Again! !” had us on the edge of our seats. But if you wanted motor sport, and there was some wonderful, diverse series around back then, you really needed to be track-side to see anything better than a low-rent taste of it on the TV. And of course there were no repeats and very few (vastly expensive) VCRs back then so if you missed it going out at some odd time , you never really missed it. There was no catch-up. 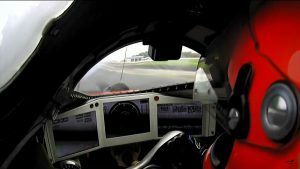 This year , thanks to the wonders of fibre and modern broadcasting technology I watched Le Mans live from the comfort of my armchair with an excellent English-language commentary coming in via a separate feed and the option to sit next to the driver if the winning Porsche 918 on it’s epic recovery driver from early techincal traumas. In fact I was ‘with’ it’s sister car , which had been many miles ahead, as it started to grind irrevocably to a halt on the Mulsanne straight. Not just a fleeting glimpse, a cut down sound-bite in a half-hour highlights package, but a second by second experience , complete with a very minor version of that sinking feeling… The one Andre Lotterer, the driver, and every member of the team must have felt as the door popped open and there beside the car was a marshall ready to navigate the stricken Porsche back behind the barriers. There it stayed, silent, as it’s long-long lead ebbed away , helplessly. It was rivetting stuff. Don’t get me wrong it was not like ‘being there’ , not really, because nothing is quite like being at Le Mans itself. It’s an overwheming experience. But sadly there is not as many of these events as there once were. The one’s that, however good the TV coverage or the multi-in-car streaming, you have to Be There to really comprehend. And that’s rather sad. I follow MOTO GP and also the World Superbike series and while one crams in vast numbers of partisan, beying spectators, to witness the near God-like figures of Rossi and Marquez in action the other plays out to often empty grandstands despite brilliant on-track action. My good freind Reg, who I see at almost every hillclimb event, is an octegenarian enthusiast who has been there for motor sport events of all sorts, styles and wheel configuratins since the late 1940s. He must have spent more time and money doing this than anyone else I know of but he told me this year he was watching the British round of the World Superbikes on TV . Why? Well it turns out they used to run both races on one day , and now it’s one on Saturday the other on Sunday and so you only get half the action unless you do both , and pay twice.. and Reg , rightly, concluded that was a mug’s game. Judging by those acres of unoccupied grandstands I could see in the background at most rounds, it’s clear he is not alone in that view. So if you did pay to go and watch, yes the action would be good, but probably twice as costly as previously (which would be rather annoying to most of us) and without a packed house, would there be the atmosphere to warrent actually being there ? At least compared to sitting at home watching it for free, on a screen, conveniently close to the kettle and biscuit tin? And when it was over you could still go outside and mow the lawn in less time than you would have taken to exit the car park at the circuit. Not to mention the 2-hour drive home. Has this kind of series done-itself-in as an event to go-and-watch? Has it become to costly and now one for streaming instead? 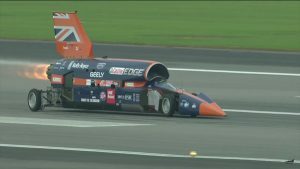 Recently the new BLOODHOUND SSC Land Speed Record car ran in public at an airifield in Cornwall and ran a couple of 200mph+ passes each day before a hoard of eager paying enthusiasts. That was an event in the old style. Being There would be something to tell the grandchildren about. But equally it was streamed live over the web and so we could all , virtually, Be There too. Then, rather than stand on the apron of a windy airfield we could simply flick over and watch every heat in the final Speedway GP of the season from Australia and maybe a rerun of the Bathurst 1000 touring car race also from Australia , then taking in some of the extensive coverage of the Mexican F1 GP (hours and hours of it…) We certainly have come a long way from Murray & James trying to tell us what was happening off-camera while we were stuck watching Alan Jones lap-after-lap on his way to a largely uneventiful victory! Have we reached the point where it really is just a TV-sport for all but a very few, choice, events?